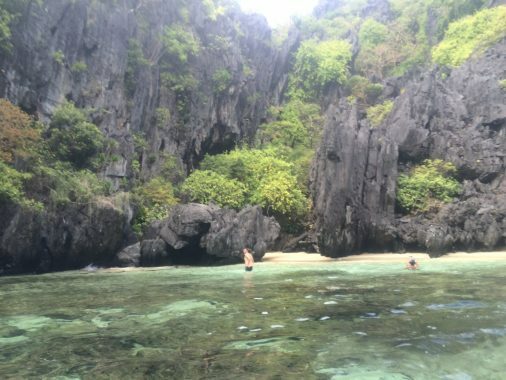 El Nido, a place that I heard for the first time in 2012 on a travel blog. 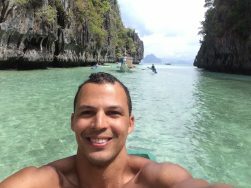 The author was a Brazilian guy who had been around the world and he said that it was one of the most beautiful places in the world he had seen. This caught my attention! In 2014 I traveled to Asia and visited Thailand and Vietnam. 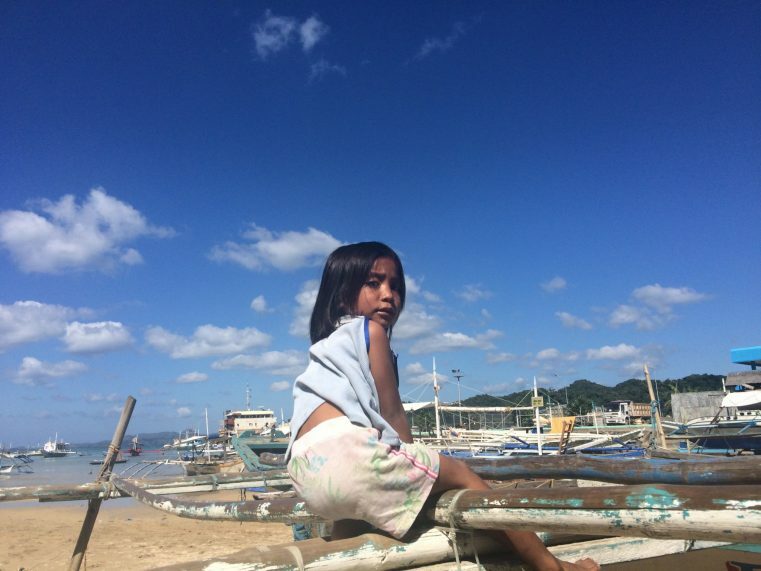 A year later, I went back to Asia and visited China and finally the Philippines. 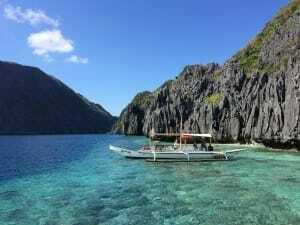 The Philippines has more than 7000 islands, and I didn’t know how many I could see in only ten days, but I was very sure of two things: I would swim with whale sharks in Oslob, and see the spectacular El Nido in Palawan. To get to one of the most beautiful places in the world is not easy, and this is what makes it not your usual tourist destination. 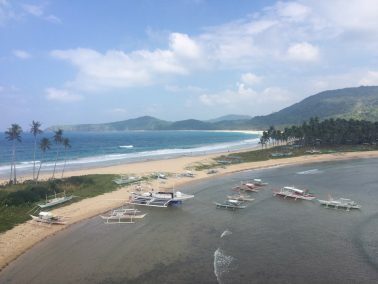 There are basically only two ways: taking an airplane from a private hangar in Manila (ITI is the only company in operation) or taking a flight to Puerto Princesa (Palawan’s capital) and then a 6 hours bus or van ride to El Nido. I splurged and took the most convenient and fastest way (almost US$ 300), the 55min flight on a 50-seater ITI aircraft. After around 30min into the flight I began to see a vision of heaven on hearth: lush tropical vegetation, mountains and emerald water! I was so excited to see one of the most beautiful places in the world. For more information about the Philippines visit the site It’s more fun in the Philippines. 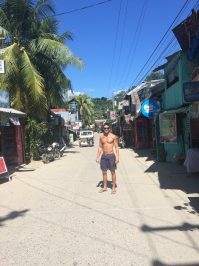 El Nido town is small and very undeveloped, a kind of place where ATM’s and electricity are scarce as is your sense of time. However, most of the hotels have a generator, although some of them do not. The common mode of transportation is by tuk-tuk and motorbikes; cars are very rare. The main street boasts of hotels, spa massages, restaurants, travel agencies and stalls serving filipino street food. The main street of El Nido town, the Philippines. El Nido town, the Philippines. 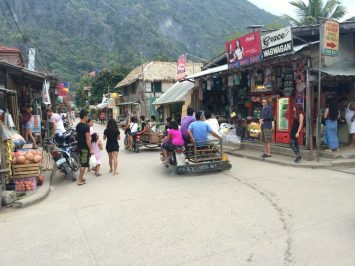 Tuk-tuk, the most popular form of transportation in El Nido town. I stayed in a simple water front beach hotel with a breathtaking view situated almost at the end of the main street. I just checked-in and then left to wander around the island, look for day trips and spend my afternoon on one of the beaches. The people that I asked recommend that I go to Las Cabañas beach, and after a 25min walk I got there. 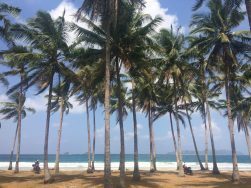 The beach was exceptional and very scenic: hundreds of coconut trees, soft sand, tranquil and warm water, with beautiful mountains in the background. I sat strategically at the corner of the stretch of beach, the best spot to see the sunset. The sunset was picturesque and unique: shades of gold painted the sky behind the silhouette of the mountains. 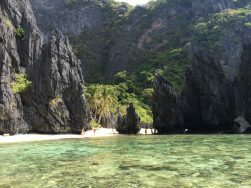 Las Cabanas Beach, El Nido. 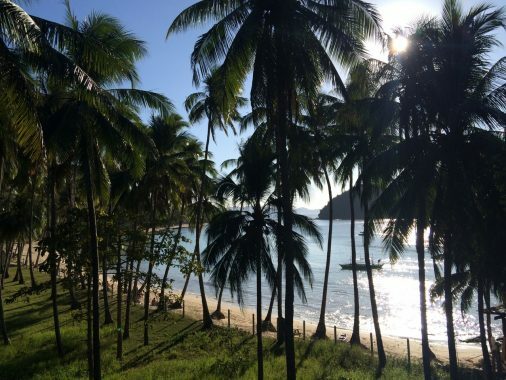 Endless coconut trees at Las Cabanas Beach, El Nido. 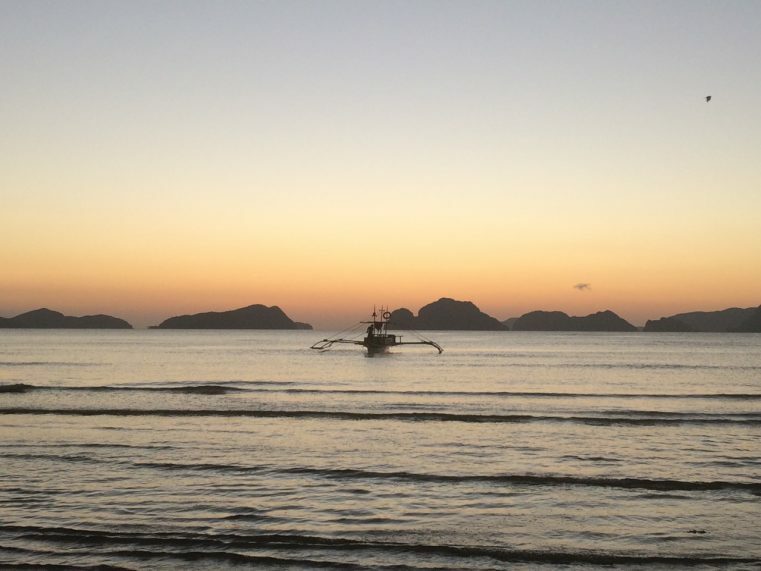 Sunset on Las Cabañas Beach, El Nido. 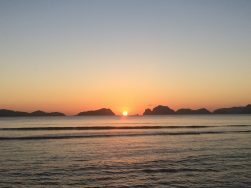 Sunset at Las Cabanas Beach, El Nido. 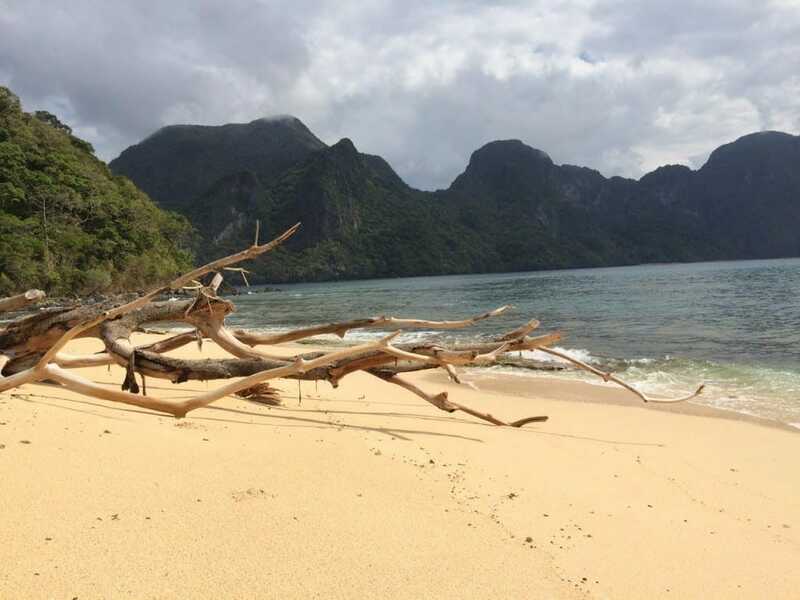 There are four island hopping trips to take in El Nido: A, B, C and D (A and C are the most popular ones). They all take you to different and awe-inspiring places and cost basically the same price, around US$ 20 for each one. 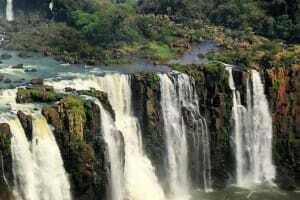 The first two places were Small and Big Lagoon, which are included in tour A. 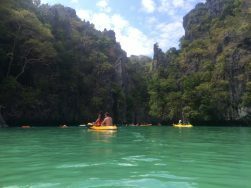 So, the next day I gathered with a group of 14 other tourists and we took our banca, a traditional Filipino boat, to discover some sightseeing treasures. 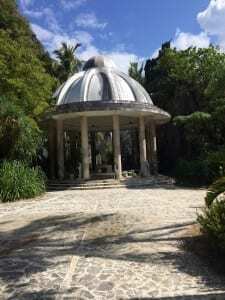 Arriving at the first stop, Secret Lagoon, I could see a small white sandy gorgeous beach with coconut trees and jagged mountains covered with vegetation and crystal-clear emerald water. 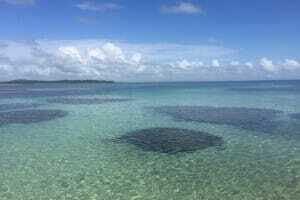 Though I could not imagine where the Secret Lagoon was, I got off the boat and walked on the corals, which was not easy. When I reached the stretch of sand I finally saw the entrance of the Secret Lagoon. One by one we had to crawl through a tiny hole in a limestone wall to reach it. The Lagoon really is a secret and beautiful, like a pool of green water surrounded by mountains and vegetation. I wondered how they found this place… it’s like a treasure in the middle of the ocean…! 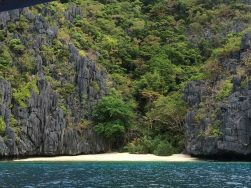 White soft sand, limestone jagged rocks and coconut trees, Secret Lagoon, El Nido. The second stop was an island close to the Secret Lagoon we stopped for snorkeling. Just our boat stopped there, so we had the place to ourselves. While we snorkeled our crew prepared our lunch: grilled squid, chicken and fish, rice, salad and some fresh fruit. Everything was so tasty that it was hard to believe that three young guys cooked the meal. The snorkeling was amazing, and besides the great variety of colorful fishes I also saw orange, and blue clams. I even had time to rest and sunbathe before heading to the next stop, the Big Lagoon. It is easy to run out of adjectives to describe the place that brought me all the way to the Philippines… The entrance to the Big Lagoon is whimsically magical! We cruised into the Big Lagoon in shallow emerald crystal-clear water surrounded by mountains. It was breathtaking and unforgettable. I was in awe while the boat sailed through the peaceful water. It was so exotic and miles away from reality. 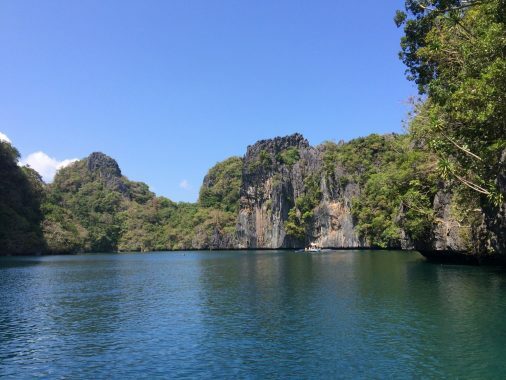 The boat made a lap around the Big Lagoon and stopped in front of the most famous and photographed spot in El Nido. Shades of green and a giant jagged rock that I had seen so many times in pictures were there in front of me. I spent most of my time at Big Lagoon hypnotized by the breathtaking beauty of one of the most beautiful places in the world. 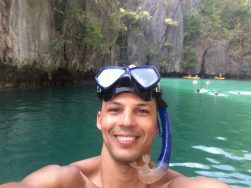 Leaving the Big Lagoon, El Nido. The next stop was the Small Lagoon, and to my surprise it was as beautiful as the Big one. However the entrance was completely different. It was difficult to access Small Lagoon. The boat stopped and I had to jump in the water (taking a kayak would be another option), swim and pass carefully through a small hole in order to reach the Small Lagoon. The blue-sky, craggy mountains capped with vegetation and the sun sparkling on the shades of emerald water seemed like a daydream. The Small Lagoon was another hidden gem in this island hopping. Yet this crystal-clear Lagoon was not so small despite its name. 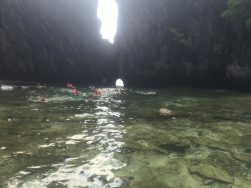 Dozens of adventure seekers were kayaking, swimming, snorkeling and getting the most out of one of the most beautiful places in the world and in El Nido. Sooo happy !! 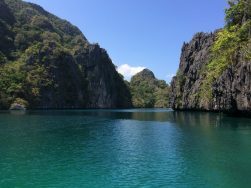 Small Lagoon, El Nido. The final stop of tour A was Seven Commandos Beach. 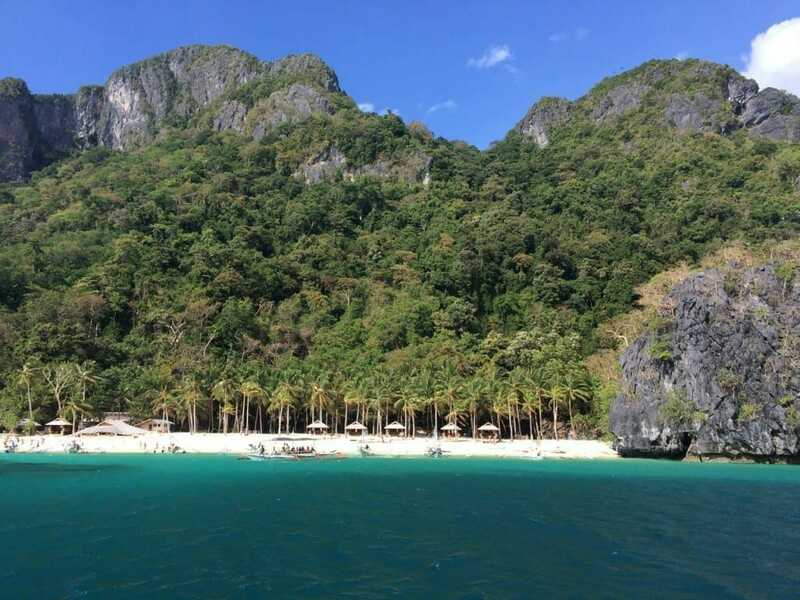 The swaying coconut trees, powdery white sand and crystal-clear water looked extremely picturesque from the boat. A perfect beach whether for snorkeling, drinking cold beer, playing volleyball or just sunbathing in the warm breeze. At night I mingled with tourists and locals at the beach for dining and enjoying live music. El Nido has a kind of old-school nightlife with everyone gathered in only one bar drinking, singing and making new friends. Someone said it seemed like Bali in the 80’s, however I’ve never been to Bali, especially in the 80’s, but it felt great being in El Nido. 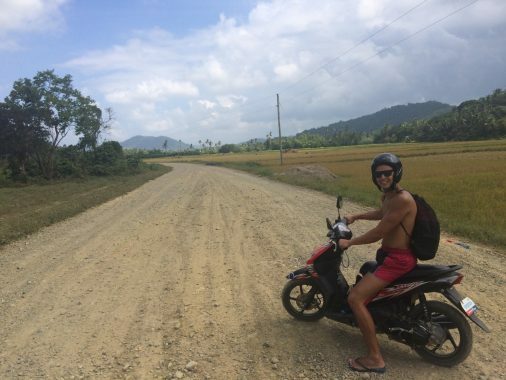 The next day I was supposed to go on tour C but it was cancelled due to ocean conditions (the current was too strong), so I rented a motorbike instead. Nacpan beach is about a 45min drive to the north of El Nido town. My idea was to stop by two waterfalls on the road and spend the day at the beach. The problem was the road was too dangerous: dirty, no pavement on most of the road, no signs, I got lost, saw only one waterfall, and fell down twice but, I had a lot of fun. There were acres of rice fields that were showing off spectacular colors. 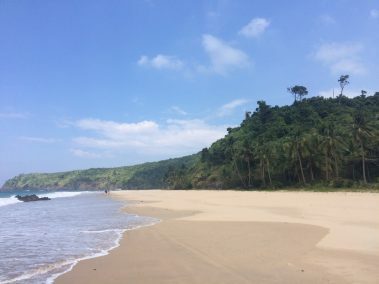 The beach was dotted with coconut trees and lush vegetation, very quiet, and with warm water. I also visited the Twin beaches, which were a very short hike from Nacpan beach. It was a great adventure!! On the way to Nacpan Beach. 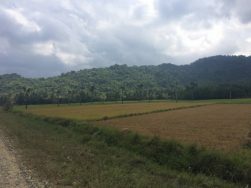 Rice fields by the road to Nacpan Beach. On the third day I finally made it to tour C.
The first stop was Helicopter Island, a secluded island with beautiful beaches surrounded by mountains with opulent vegetation. It was very quiet and gracious, and the best part was that the island hopping was just starting. A short ride and we arrived at the second destination: Cadlao Lagoon. 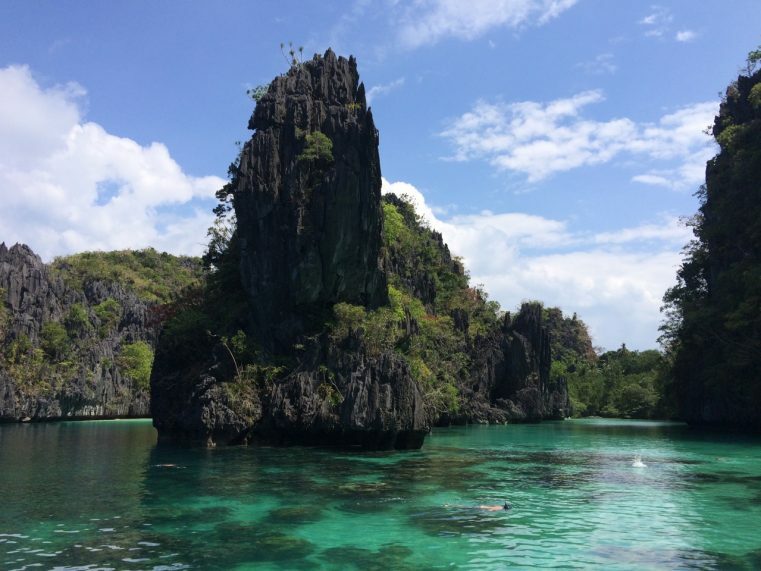 Yet again another breathtaking place in El Nido, with huge mountains blanketed by colorful trees, the sun gleaming on the emerald-turquoise water and a huge jagged rock shooting majestically up from the sea. 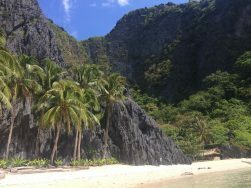 I was completely enthralled by how many gorgeous places there are in El Nido, and completely sure that this is one of the most beautiful places in the world. Emerald water and lush vegetation, Cadlao Lagoon. 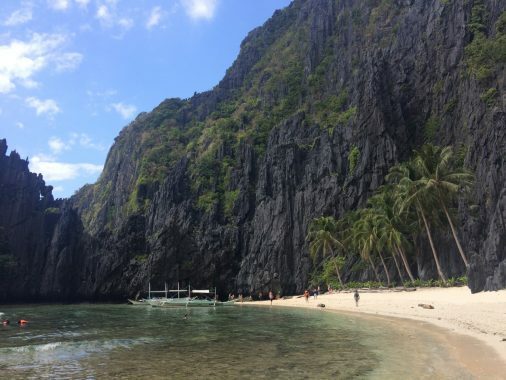 After the next boat ride, another Filipino treasure was unveiled: Secret Beach. 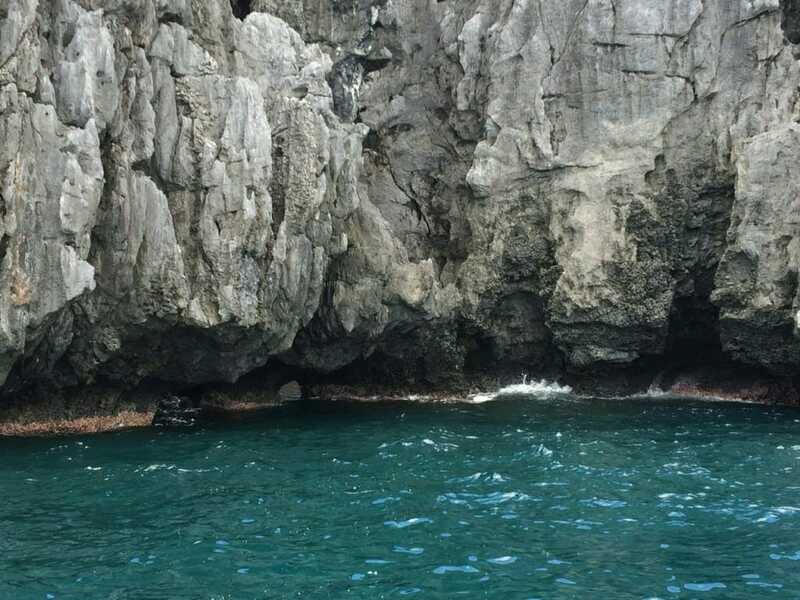 The guide said that we would stop the boat and swim through a sinkhole in order to get into the beach, but I could only see steep rock walls! I jumped into the water with my snorkel mask and followed the guide. 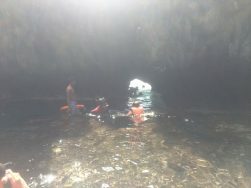 The current was kind of strong, however the water was so clear that we all made it through the hole. I walked on the rocks until I reached the pocket of white sandy beach with extremely clear emerald water surrounded by limestone rocks. To leave the beach was hard because the waves were coming in extremely high and covered the hole completely. We were just able to swim back to the boat because our guide and captain coordinated our exit. What an amazing feat! 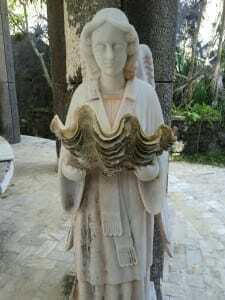 The final stop of tour C was another stunning beach: Matinloc Shrine. I jumped off the boat, swam, walked on the rocks until I reach an abandoned mansion on the island. I hiked a little in order to have a privileged view of the beach from the hill. And what a view, OMG! 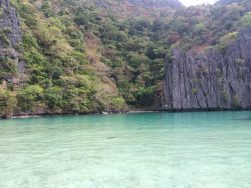 Limestone toothed rocks, endless sea, and the bancas on the pristine emerald-turquoise water made up the bucolic scenery. I still had time to visit the pier where I could see other islands and see the beach. Banka parked at Matinloc Island. 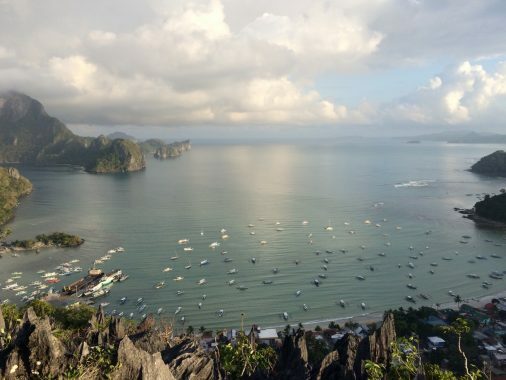 The rest of my trip, I did the Taraw Cliff hike to see the sunrise and to get a birds-eye view of Bacuit Bay. 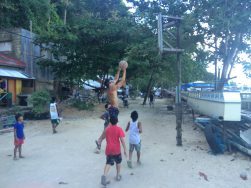 Later I did tour A again, played basketball with local children and beach volleyball with other locals, and laughed while children chased me when I was running. I slept every night with my doors open listening to the sound of the waves, and woke up every day very early for a walk on the beach. Playing basketball with children in the town. Leaving one of the most beautiful places in the world was very hard for me and I was in tears. It was hard to imagine that in a few hours I would be going home and I would have only pictures and memories that would have to last me forever. Good bye at El Nido’s airport. 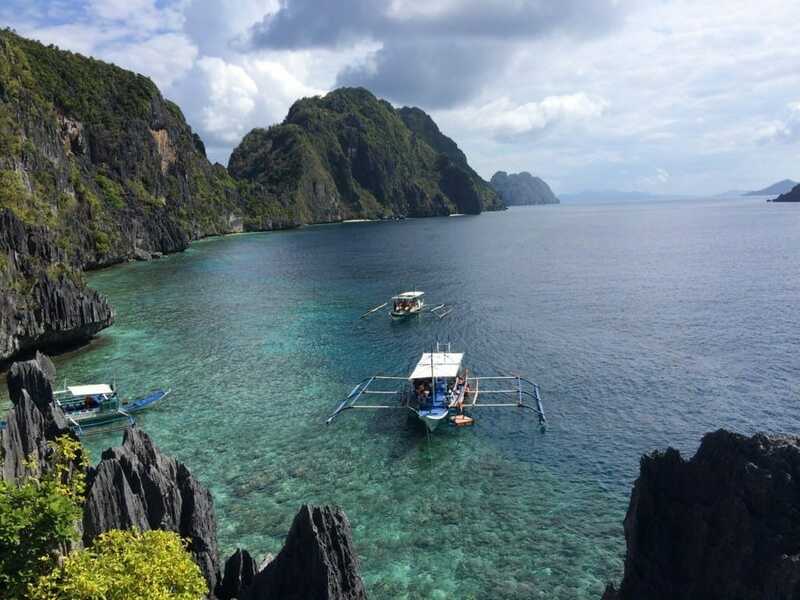 El Nido is more than one of the most beautiful places in the world it is also extremely spiritual. It makes you glad to be a part of this amazing planet! 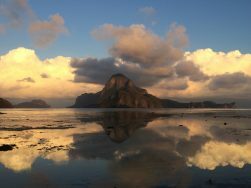 El Nido leaves us memories of its extraordinary natural splendor, pristine geologic formations and untouched ecosystems. 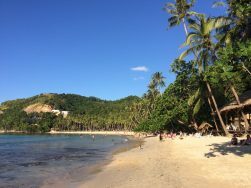 If you’re visiting Boracay, here is The Complete Boracay Travel Guide. 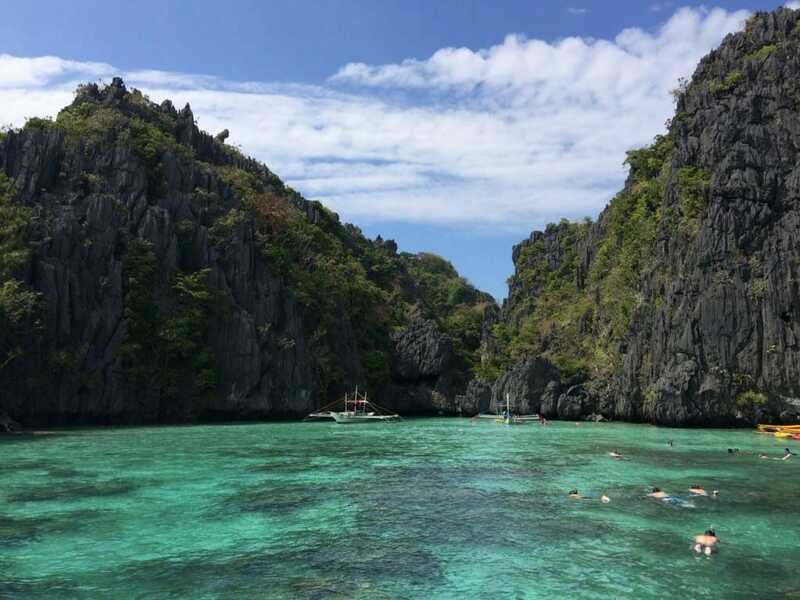 Another stunning place to visit in Palawan is Honda Bay and Starfish Island. Visiting the Philippines for two weeks? Here is the perfect blend for your 2 week Philippines itinerary. 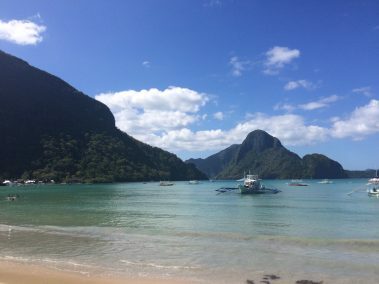 If you’re traveling in the Philippines as a vegan, check this post out: Is it hard to be vegan in the Philippines? 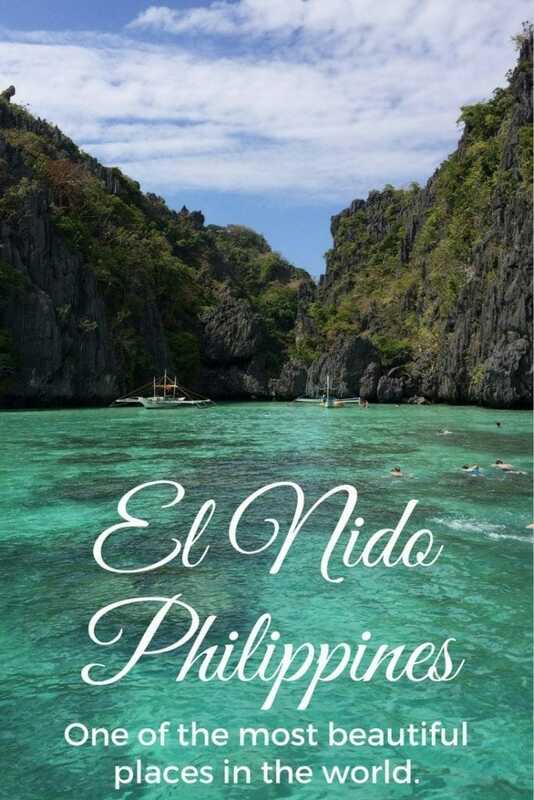 El Nido is located on the north end part of Palawan, which is about 420 kilometers southwest of Manila, and 238 kilometers northeast of Puerto Princesa, Palawan’s capital (check map here). 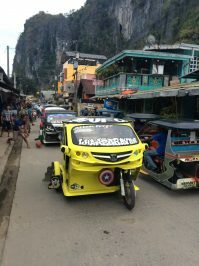 Flying to Puerto Princesa and from there you have to cover 220Km of highway and it can take 6h with a van until El Nido. 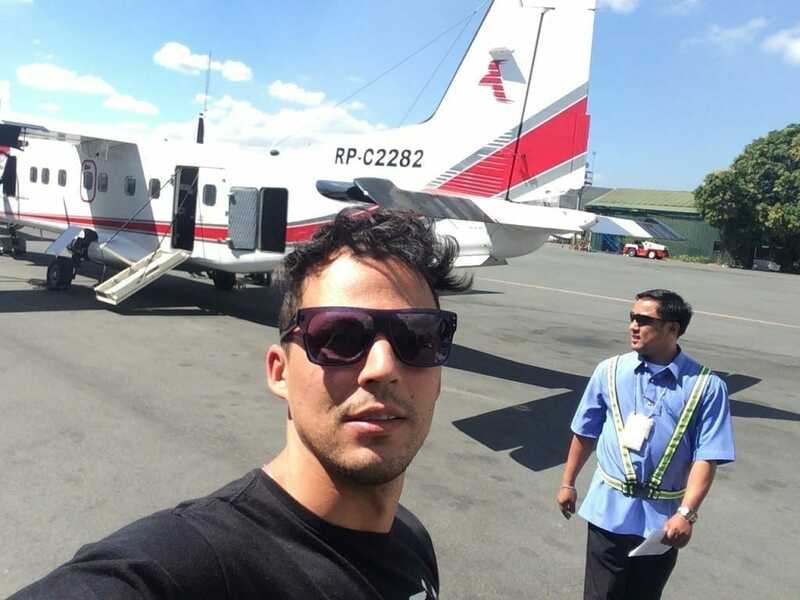 The most convenient, fastest and expensive way is take a 50min flight from Manila. 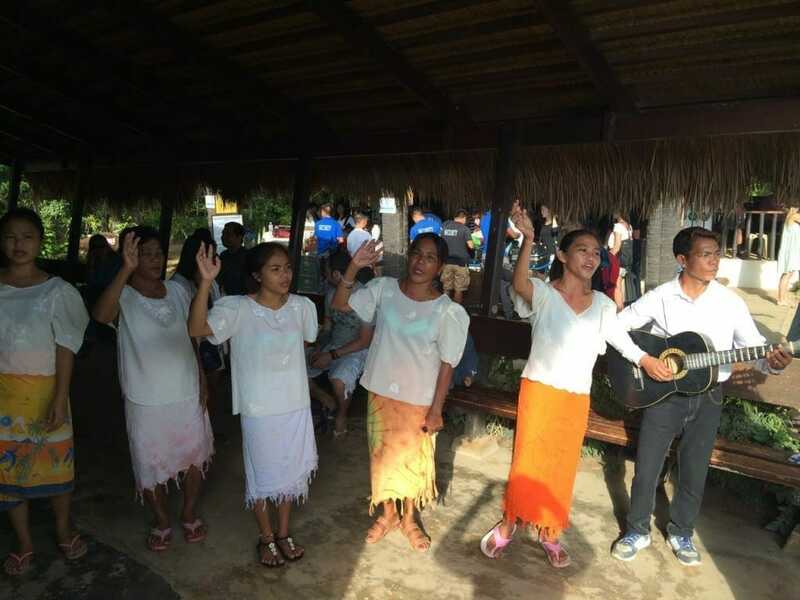 ∗ Cebu Pacif, Philippines Airlines and AirAsia are companies that fly to Puerto Princesa. ∗ ITI is the only company which operates from Manila to El Nido and to get the ticket you need to contact El Nido Boutique and Art Cafe. 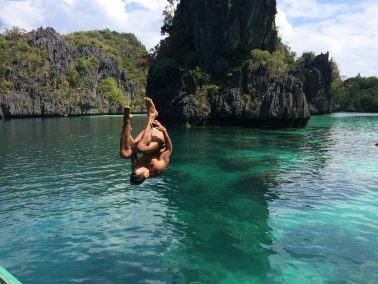 El Nido can be visited all year-round but the best time to visit is from December to March when the weather is more pleasant and it’s the dry season for most of the Philippines. I stayed at El Nido Beach Hotel. ∗ Round-trip flight with ITI Airlines: US$ 310. ∗ 5 nights at El Nido Beach Hotel with breakfast included: US$ 480 standard room for two. ∗ Island Hopping: US$ 20. P.S. : You can try to get a small discount with some agencies that are on the way to leave the town, not with the ones on the main street. Also try to book more than one tour at once and for more people. Here is a visa guide for the people who want to visit the Philippines: Philippines Visa Guide. 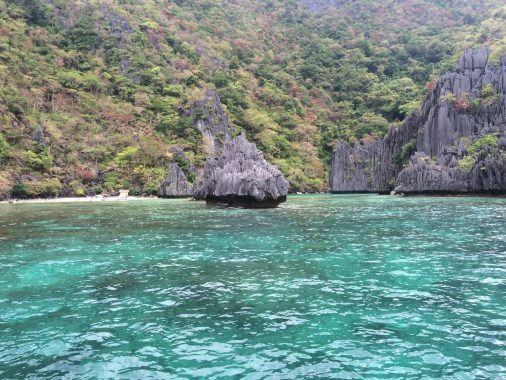 I just got back from visiting El Nido and I have to say that you described this beautiful and precious on the spot. It is truly the most beautiful places in the world not only because of its natural beauty but the people there were so humble, respectful, honest, and pleasant. They know how to treat people well. Thank you so much for your kind words Rajat!! 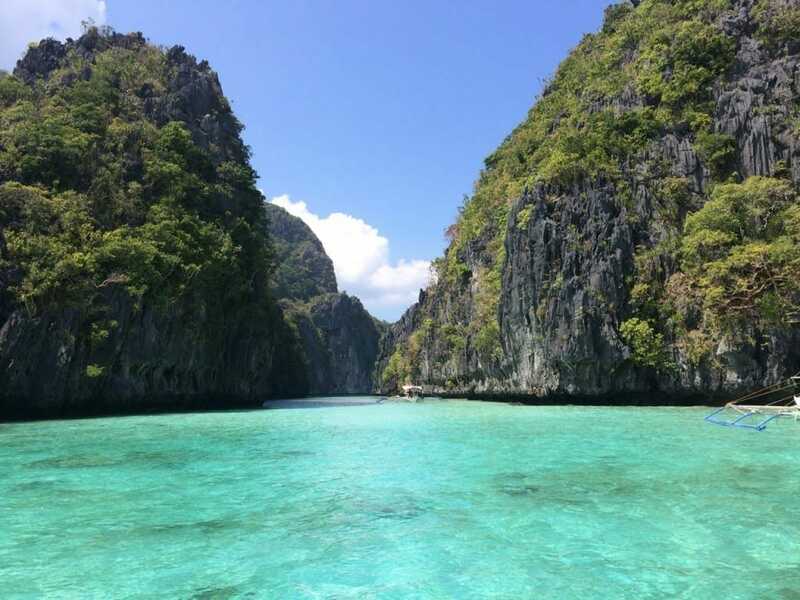 El Nido is truly amazing.